Sphaera creates interactive CBT courseware for truly engaging classroom tutorials covering aircraft electrical systems both commercial and military aircraft. Electrical systems can be built-up as a series of easy to understand steps, allowing the instructor to clearly explain the functions of each component as they are introduced. 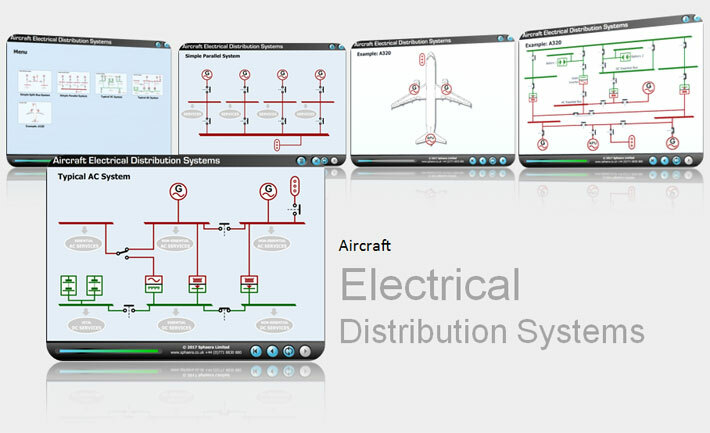 The package of electrical distribution systems shown below is available off-the-shelf and includes split-bus, parallel, typical DC, typical AC systems as well as the system from the Airbus A320. To aid the students understanding, components such as busbars, switches, relays, generators, circuit breakers, inverters and TRUs are all interactive (and can be operated by clicking with the mouse). Circuits can be provided with or without automatic signal tracing.